Gallery / Saga Press, 9781481485562, 800pp. Supernatural meets The Da Vinci Code in a fast-paced, kickass character driven novel (previously published serially at SerialBox.com/Serials/Bookburners) chock-full of magic, mystery, and mayhem, written collaboratively by a team of some of the best writers working in fantasy. 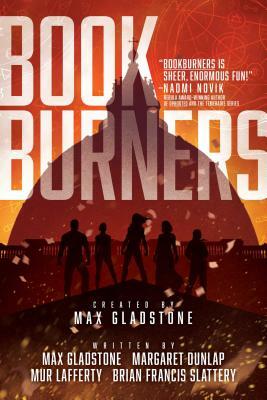 Max Gladstone is the author of the Hugo-nominated Craft Sequence, which Patrick Rothfuss called “stupefyingly good.” The sixth book, Ruin of Angels, was released this September. Max’s interactive mobile game Choice of the Deathless was nominated for the XYZZY Award, and his critically acclaimed short fiction has appeared on Tor.com and in Uncanny Magazine, and in anthologies such as XO Orpheus: Fifty New Myths and The Starlit Wood: New Fairy Tales. John Crowley described Max as “a true star of twenty first century fantasy.” Max has sung in Carnegie Hall and was once thrown from a horse in Mongolia. "As much fun as binge-watching a full season of a Showtime series." "[The] breakneck pace never feels rushed, and its balance between the horrifyingly demonic and the hilariously clever never falters." "Fast-paced and pulpish…could win a devoted audience and keep going for season after season."